Field testing has begun for new Google search features that incorporate results from Gmail, Google Drive and Google.com search. During the field test, Gmail users will see results that include actual emails as well as content from Google Calendar, Google Drive and enhanced flight tracking information when searching from within Gmail. 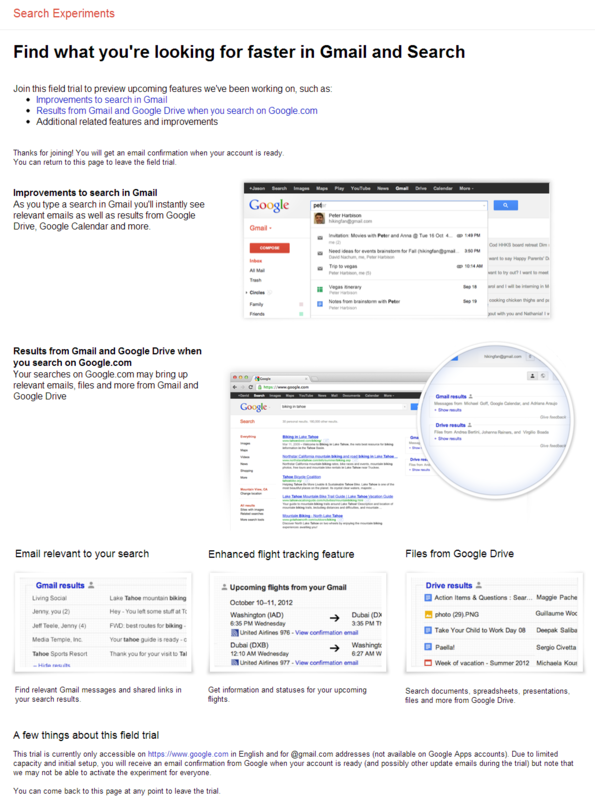 Users participating in the expanded search field test will see results from Gmail and Google Drive when searching with Google.com. Think branded content. If you use Google Calendar invites/events or shared Google Drive documents to facilitate client interactions, those calendar invites/events and shared documents better have your company name, contact information and project name listed on it. The goal here is to make your shared calendar invites/events and Drive documents accessible for search – so your content displays when a client needs relevant and related information about you, your company or the project you are working on together. The same line of thought applies here. Brand those emails baby! Make sure your signature has a link to your website, blog and social networks, subscription and contact forms (and your company name). Include keyphrases that are both relevant and related in the body of your email (consider using headings) and always make good use of short, descriptive subject text. Again, the goal is to get emails ‘indexable’ AKA optimized for search. As if optimizing your website, blog, content, social networks wasn’t enough to keep you busy, now closer consideration will need to be given to outgoing email, calendar invites and events created. It does fall in line with providing a universial search experience, but could ultimately ‘clutter’ the SERP (search engine result page). I really hope it never makes it out of testing. If I want to search email, I search email (etc.). I agree as well, simple and clean is the way to go.